The Putnam River Trail is a paved walking path that runs almost completely along the Quinebaug River from Providence Street to the Hale YMCA for a distance of 2 miles. While walking here take notice of the old mill buildings as well as the river. For this walk, start at the public parking area along Kennedy Drive just south of U.S. Route 44 and follow the paved walking path north towards the dam and waterfalls. After crossing U.S. 44 you will get a great view of the falls from the bridge. From here continue north into Rotary Park. The path splits and forms a turnaround with veterans memorials in the middle. The river Trail continues north to Providence Street for another half mile. For this walk follow the turnaround and continue now in a southerly direction crossing U.S. 44 once again and passing the parking area. The path follows both the river and Kennedy Drive at times being sidewalk for six tenths of a mile then comes to a pedestrian bridge that crosses the river. There was once a railroad crossing here, The views of the river are quite nice here. At the far end of the bridge there is signage indicating that the trail ends. Cross back over the bridge to Kennedy Drive. For this walk, turn left and retrace your steps back to the parking area to conclude the walk of a mile and a half. If you would like to add more distance turn right following the sidewalk. It soon turns into a walking path again passing a dog path and comes to a road with a bridge crossing the river. Turn right, cross the bridge, then left and follow the walking path to the YMCA. This is the newest section of the walk is about seven tenths of a mile. From the YMCA retrace your steps back to the parking area. If you choose to do the entire walking path out and back it will be about 4 miles of walking. Easy with some slight elevation. I think I have always been a bit of a naturalist. I would rather spend time in the woods rather than in front of a computer. I have always been tremendously intrigued by Thoreau and not so much Jobs or Gates. I would choose Walden Pond over the city any day. But this is the age of technology. Social media has come to rule my life for better or worse. With that being said, a year and a day ago I was contacted by a blogger simply known as Auntie Beak. She came across my hiking blog and suggested that we should talk. She was working on a similar project and we over time eventually became Facebook friends and became members of the same hiking groups. A series of misfortunes occurred last summer. Auntie Beak broke her ankle hiking Escoheag Trail in Arcadia in July and I followed in a less honorable Downtown Providence drinking incident of breaking my ankle in August. Obviously, we both needed to heal and then a long, cold, almost unbearable winter set in. In late April a rain delay of sorts would play into the cards. But at last… Auntie Beak and I have hiked together. Auntie Beaks blog is a wealth of information of the Southeastern Connecticut and Southern Rhode Island trails. I often refer to her site for hikes. She is also very knowledgeable in fungus and flowers. I have never been much into botany, but as of late, my interests have been peaked. I am grateful to have met Auntie Beak and the many others I have met through social media that have the same love and passion for the outdoors that I have. With that being said, today’s hike… Pulaski Park is a beautiful state park with Peck Pond as its centerpiece. The entrance road to Pulaski Park is off of Route 44 in Glocester, however, the parking area and all of the trails we hiked on the Rhode Island side are in Burrillville. We started from the main parking area near the restrooms. We followed the path to the beach area then turning right following a trail that was blazed white with a blue dot. This trail meandered through dense woods with some rocky footing. We had initially started off trying to follow the yellow blazed trail but took a wrong turn somewhere along the way. Whoops! We ended up doing a loop that brought us back to the beach area. We decided then to head over to the bridge that crosses the dam. The bridge aptly named the RI-CONN bridge crosses over into the extreme northeastern corner of Putnam, Connecticut before entering Thompson. We then followed a gravel road for a bit back into Burrillville. At the split we followed the road to the right. This road would eventually come to a covered bridge passing first some streams and old man-made stone works of interest. Most of this road had an occasional yellow blaze. 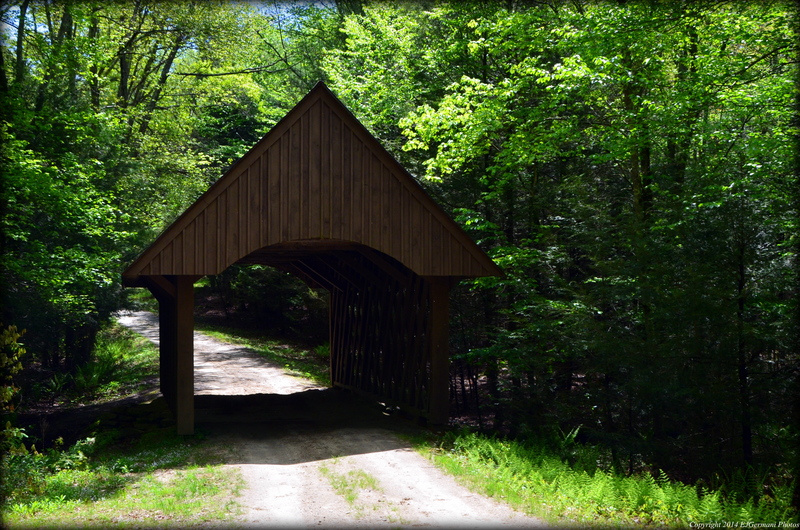 Shortly after the covered bridge we came to a short trail on the right that would lead uphill to another gravel road. We then turned right following the road to a trail on the right that would cut through an open field. At the next intersection we went straight completing a loop that came out to our left. We should have turned right. From here we turned left at the next intersection and back to the parking area. We came across many flowers, again seeing Lady Slippers, as well as mushrooms and fungus on this hike and many insects. I did not see any wildlife other than birds and the occasional squirrel. Trail map can be found at: Pulaski Park-Peck Pond.